"These three characteristics - one, contagiousness; two, the fact that little causes can have big effects; and three, that change happens not gradually but at one dramatic moment - are the same three principles that define how measles move through a grade-school classroom or the flu attacks every winter. Of the three, the third trait - the idea that epidemics can rise or fall in one dramatic moment - is the most important, because it is the principle that makes sense of the first two and that permits the greatest insight into why modern change happens the way it does. The name given to that one dramatic moment in an epidemic when everything can change all at once is the Tipping Point (Gladwell, p. 9)." "While Peter and John were speaking to the people, the priests, the captian of the temple, and the Sadducees came to them, much annoyed because they were teaching the people and proclaiming that in Jesus there is the resurrection of the dead. So they arrested them and put them in custody until the next day, for it was already evening. But many of those who heard the word believed; and they numbered about five thousand(Acts 4:1-4)." "But among them were some men of Cyprus and Cyrene who, on coming to Antioch, spoke to the Hellenists also, proclaiming the Lord Jesus. The hand of the Lord was with them, and a great number became believers and turned to the Lord (Acts 11:20-21)." "But each of us was given grace according to the measure of Christ's gift....The gifts He gave were that some would be apostles, some prophets, some evangelists, some pastors and teachers...(Ephesians 4:7-11)." 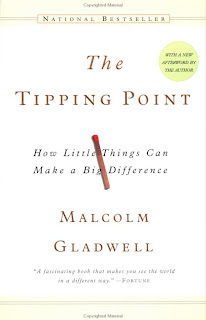 I just wanted to follow up with my thoughts of Malcolm Gladwell's (2000) "The Tipping Point." Last time I briefly touched on two main ideas of the book. The first was the idea that social epidemics occur in pretty much the same fashion as biological or medical epidemics. This point is illustrated in the first quote above. The other idea was his argument that in many if not all social epidemics, the three types of people who are essential to the movement spreading are Connectors, Mavens, and Salesmen. In this follow-up, I want to share my thoughts on how I think these two ideas can be applied to our understanding as Christians of the roll all of us play in the Great Commission which Jesus outlined for us in Matthew 28:18-20. I am going to begin by highlighting what I think are some general connections between the gifts God has given us and the three types of people described by Gladwell (2000), and conclude by drawing similarities and distinctions bewteen Gladwell's "Tipping Point," and what I believe to be the Christian equivalent. In the last quote, Paul lists a few gifts that God has given us, to be used in the spreading of Jesus' ministry. Like Gladwell's (2000) descriptions of Connectors, Mavens, and Salesmen, the gifts that have been distributed among believers each play a specific role in the movement. For instance, the gift of teaching may embody certain skills, dispositions, and temperaments that differ from the gift of evangelizing. Now of course these gifts do not have to be independent of each other, because I believe that we are all born with multiple gifts. Further, I believe that which gifts are able to "sprout up" and which ones are "shut down" has a lot to do with our environmental influences, but that's a topic for another time, lol. In addition to this idea that we as individuals play an important role in bringing about movements or social epidemics, Gladwell and Paul (or someone writing in the name of Paul) are suggesting that humans are inherently social, therefore understanding our gifts, skills, and temperaments is to understand the great movements or social epidemics of our time. Indeed, Stiles (1995) echoes this notion of social influence in his book "Speaking of Jesus," where he talks about the significance of divine appointments and how the most minor or casual conversations can lead to monumental changes in people's lives. In the two instances in the book of Acts that are captured above in the second and third quotes, the Great Commission was being carried out in major ways. Large groups of people were experiencing and coming to Christ in notably dramatic fashion. In Acts 4:1-4, about five thousand people came to Christ. Now talk about a social epidemic! Similarly in Acts 11:20-21, large numbers of people also came to Christ. What could have "caused" these dramatic changes? What accounted for the spread of this "epidemic?" As mentioned earlier, Gladwell (2000) and the author of Ephesians agree that we are social beings, and thus have an important role in bringing about major change. Where I think the difference lies is in their views of what the Tipping Point is. 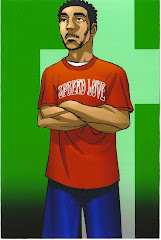 For Gladwell (2000), the Tipping Point can come about due to a certain number, context, or action. For Christians, the Tipping Point is something different. It is true that in both of these instances in Acts, there were dedicated, influential, people of God teaching and proclaiming the gospel to massess of people at the time these major changes were taking place. However, I'm certain that it was not the teachers and proclaimers themselves that caused all of those people to encounter Christ and come to believe. The Tipping Point which led all those people to come to Christ was none other than the Holy Spirit Himself. Sure, the preachers and proclaimers played a role, just as all of us as Christians play a role in sharing the love and gospel of Jesus Christ. However, I strongly believe that the roles we play are only to "set up" the situations to where God will move, bring about His will, and get all the glory in the process. Now, I'm not saying God needs us to set up these situations, because He doesn't. God will do what He's going to do with or without us. Because He loves us and calls us into a relationship with Him, He also calls us to take part in His reaching the world. This is an ongoing theme in many of Brux Cavey's messages, who is Pastor of The Meeting House in Canada. Isn't God amazing?